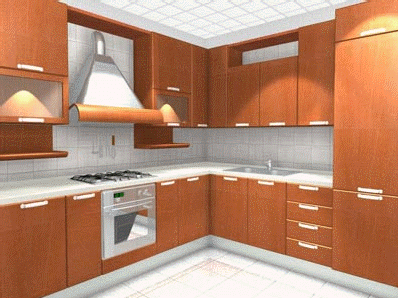 We make designing your kitchen as easy as possible. 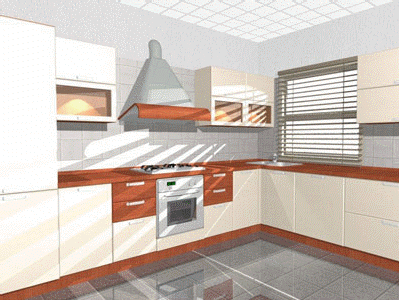 We start with your ideas – no matter how general or detailed – and help you create a kitchen to fit your budget. 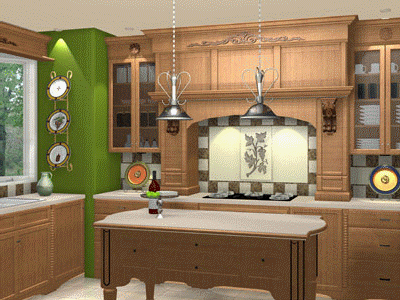 To help get us started, bring us pictures or sketches, and our team of professional designers will help you realize the kitchen of your dreams regardless of size. Make an appointment and meet with one of our professional designers to begin the translation of your ideas, dreams, and inspirations into the reality of your new kitchen. Natural, stained, painted, glazed, distressed or combinations of these are available to match your home décor or to make a statement. Glass doors, built up moldings, under cabinet lighting, spice racks, waste basket inserts, silverware organization, elegant exhaust hoods, corbels, and wine racks are just a few of the ways to create the room of your dreams. Our experienced design staff is ready to listen to your needs and show you our wide range of functional displays. We can help guide you to a design that results in a beautiful project that fits within your budget. Use the resources here to help work your way through the fundamental decisions about layout, design, materials, and more. Then meet with us to fine-tune details and work out the plans. Refrigerator and Freezer: style? sizes? Counter Space: where and how much? Islands: for convenience or special purpose? 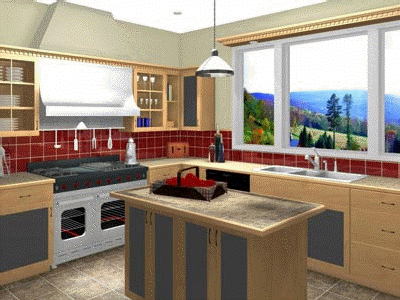 Ovens: free standing? cabinet mounted? 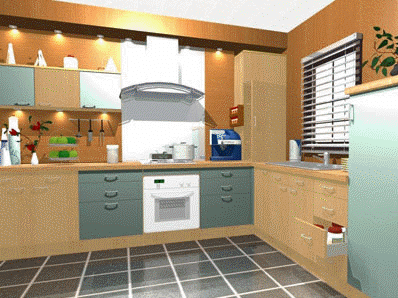 Uses: is the kitchen for more than preparing food? Eating? Gathering? Electrical: enough outlets, in the right places? 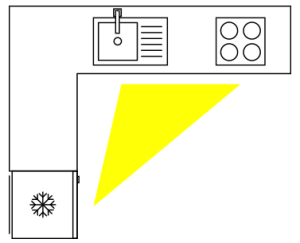 Lighting: enough, of the right kinds, in the right places? Storage: normal, flexible, special (tall items)? Recycle: should you, do you, what does that ask of design and layout? Most cabinets, countertops, lighting, and other materials for your kitchen contribute to an overall style, which may match your house or complement it. Categories can be broad, like formal and informal. They can be more specific, like Georgian, neo-colonial, Federal, Greek Revival, Victorian, contemporary.. The choice of a coherent, consistent pattern can define your kitchen as a special place – or blend it with the larger architectural scheme of your home. 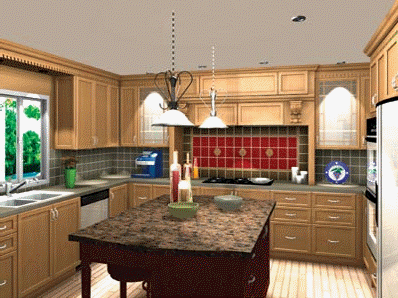 Colors may be an obvious issue when you plan a kitchen. But it’s as complex as it is obvious. For example, color can affect perceived size. 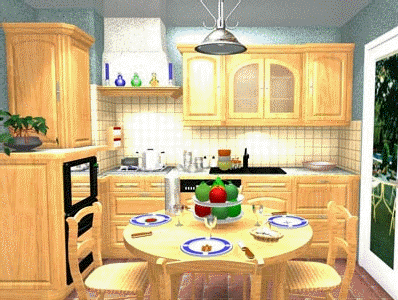 Some colors can make a small kitchen feel larger and more open. Others may close in a cavernous space. Color preferences change over time (seen any harvest gold or avocado green lately?). The Color Marketing Group specializes in predicting color trends. Whether you like them or no–you may want to be aware of what color goups are current. Colors work with textures and style to create more complex effects. If you have a preference for bright colors in your cabinets, for example, that may narrow your range of choices for countertops. And as for right now: Even if the rest of the world thinks stainless steel is the only way–you may see a road less traveled. 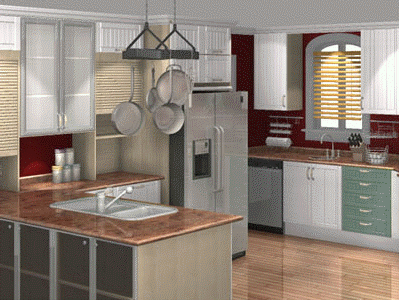 Your work patterns in a kitchen suggest optimum layout and positioning of major items and defining their relationship. Research at Cornell University in the 1940s established some of our major guidelines for kitchen planning–including the famous “work triangle”–which defines the relation between the primary work area, the refrigerator, and the sink. 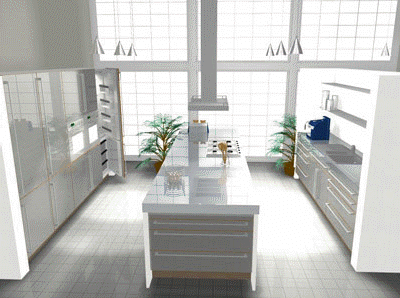 An L-shaped layout is among the most efficient of kitchen layouts. In theory, no leg of the triangle should be more than nine feet or shorter than four. Traffic routes should not cross the triangle–and there may be secondary work triangles, which complicate the situation. 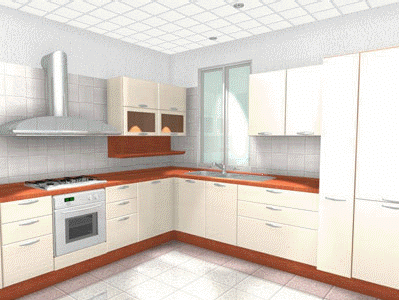 But in practice, there are often four primary work centers: refrigerator, sink, work area, and stove. In many homes, more than one person is involved with food prep. Does that make for more triangles? And if you’re using the kitchen for more than food preparation? Patterns can get complex, but it’s well to think through these issues from the perspective of needs generated by your family, your work patterns, your needs. A family member may have special needs–like wheelchair access. Or you may be committed to a particular set of design principles, like Feng Shui. You may be two families in one house, or beginning commercial food preparation, or a family of seven children or with three live-in in-laws. Don’t neglect your ability to tune any set of designs to meet your special needs–whatever they may be.